Hey friends! Many of y'all saw that our wedding was featured on the Southern Weddings blog earlier this week, and Zack and I are still so excited about that!! I have far too many pictures I want to share in one blog post, so I have decided to break our day up into a handful of posts to share with y'all throughout this week and next. Today, I thought it would be fun to start at the very beginning of our wedding day by sharing my getting ready photos with my bridal party! While this post focuses on me and my girls, I have to sneak in a few dapper photos of Zack and his guys too! You'll see why as you scroll through the post. He's simply too handsome not to! My dapper dad also makes an appearance at the bottom of this post, so keep reading! 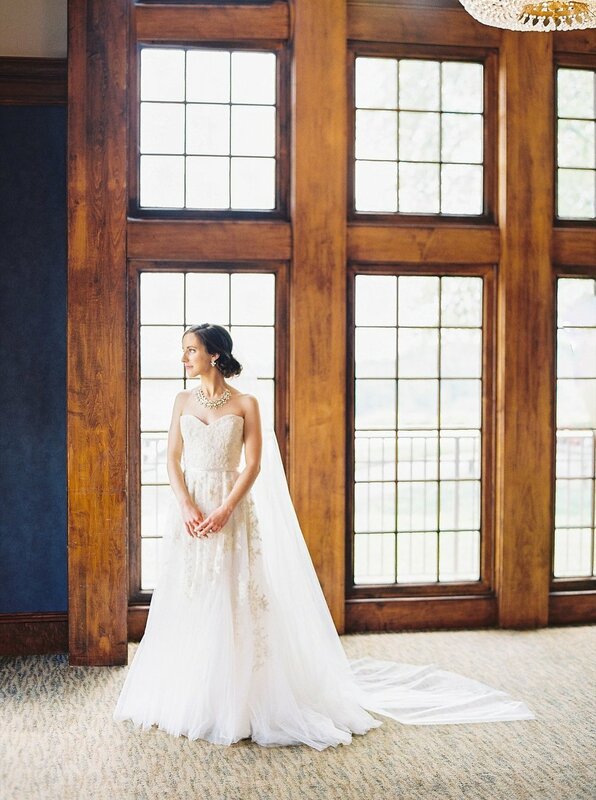 Thank you so much to miss Perry Vaile for these gorgeous photos, and to our amazing and talented siblings/in-laws Casey and Kristin and their team for capturing our beautiful wedding film! I spent a long time thinking through what accessories I would wear on our wedding day. I absolutely adore statement jewelry, and knew I wanted a bit of a bolder look while still remaining extremely feminine and romantic. 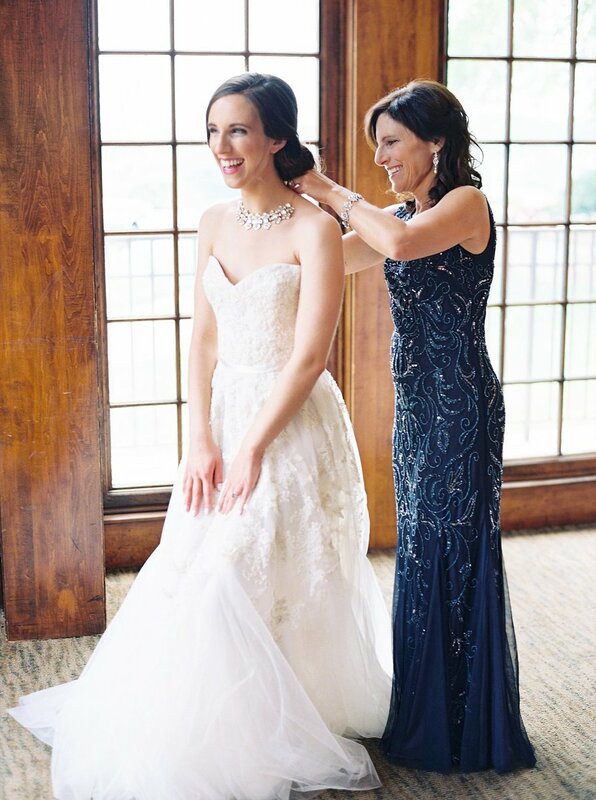 I also wanted to pair heirloom pieces from my family, with new pieces that I could keep for years and pass down to my daughters and granddaughters to wear on their wedding days! My grandma surprised me with her mom, my great grandma's, handkerchief as a Christmas gift last year. She told me she knew she wanted me to have it as a something old, and I could not get over how sweet that was! While my Nana couldn't be with me on our wedding day, I loved having a piece of her carried with me throughout those special moments. I paired my something old with a handful of something new accessories! 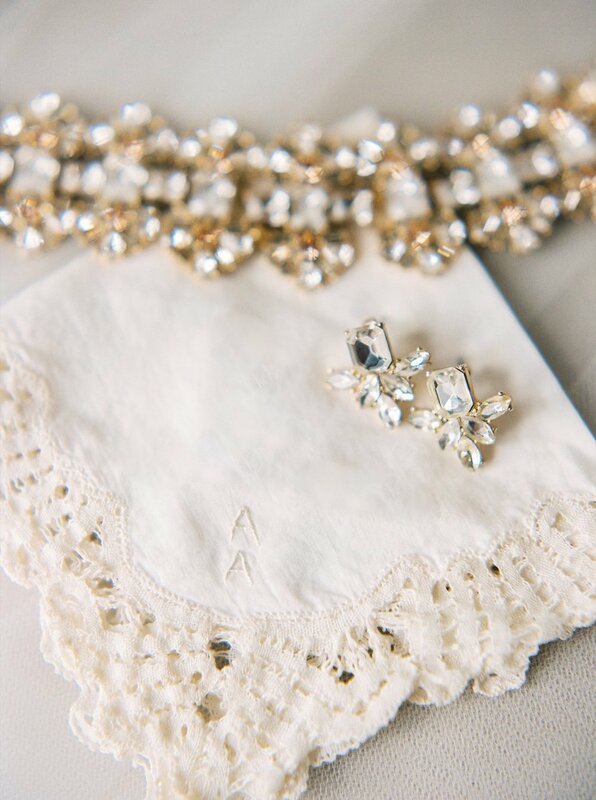 I instantly fell in love with the artistry of this BHLDN soft blush beaded clutch, wore the same Banana Republic art deco inspired earrings (paired with gorgeous delicate diamonds that Zack gifted me on our wedding day! 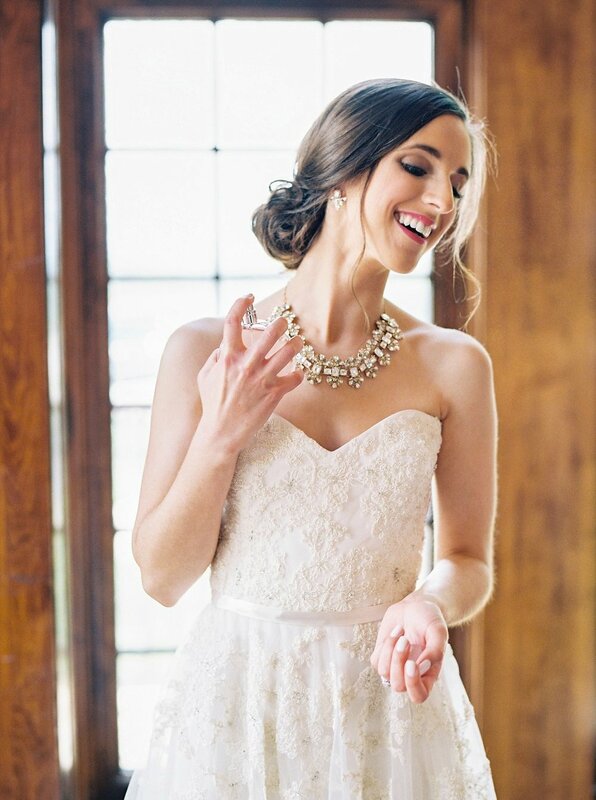 ), a coordinating J.Crew crystal bracelet, and blush and champagne peep-toe scalloped heels from BHLDN. My absolute favorite bridal accessory was this stunning Kate Spade crystal necklace my sister gifted me at my bridal shower. My jaw immediately dropped when I saw it online (as I had been searching for the perfect statement necklace with no avail until finding this piece! ), and I could not believe how gorgeous it was in person! It has a mixture of clear, blush, and pale gray crystals, which perfectly coordinated with our wedding color palette! Perfect heirloom piece to pass through the generations of Peddicord ladies? I sure think so! Our hair and makeup team from Bangs and Blush did such a gorgeous job, and made us feel truly comfortable throughout our wedding morning! 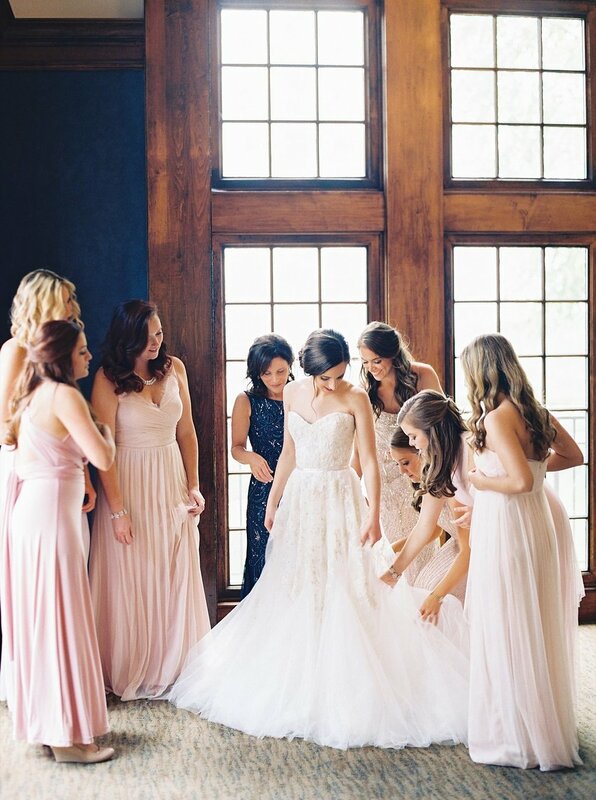 I gifted all of my bridesmaids with the sweetest robes from Plum Pretty Sugar, which allowed us to get ready in style while not having to worry about messing up our hair before getting in our dresses! My ladies wore the Ebba Amongst Love robe, and I wore the Sweet Love and Yonderflies robe! Zack was getting ready in the room right next to ours, so one of his Best Men and one of my Maids of Honor had to be on spy duty to ensure our paths never crossed! And yes you read that correctly - we each had two! One sibling, and one best friend! Look how dapper he is!! Zack would want me to tell you that he chose his groom's attire all on his own - didn't he do such a wonderful job? 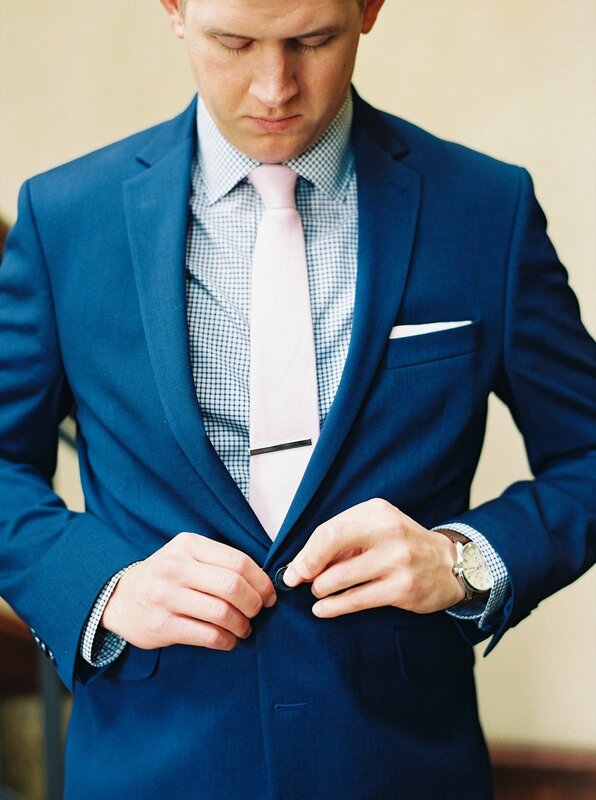 I love his mix of a gingham Ralph Lauren button down, linen soft pink tie, and Kenneth Cole bright blue slim-fit suit. It's hard to see the pattern in the photos, but I also designed custom pocket squares for Zack and his men that had the same lace pattern from my gown printed in a soft French blue! I love all of these sweet getting ready photos that Perry captured of me and my ladies! These have always been some of my favorite photos when looking through other wedding features, and it is still so surreal seeing ours! Brides, if y'all are wondering, my gown is the Heavenly Lace gown by Reem Acra with a slightly different bodice. I found my dress at B.Hughes in Nashville! Aren't my friends the absolute cutest? I love this playful photo of me and one of my Maids of Honor, Sam! And of course, my mom looks stunning as can be! I swear she looks like she could be a bridesmaid. I hope to look that youthful when I am a Mother of the Bride! 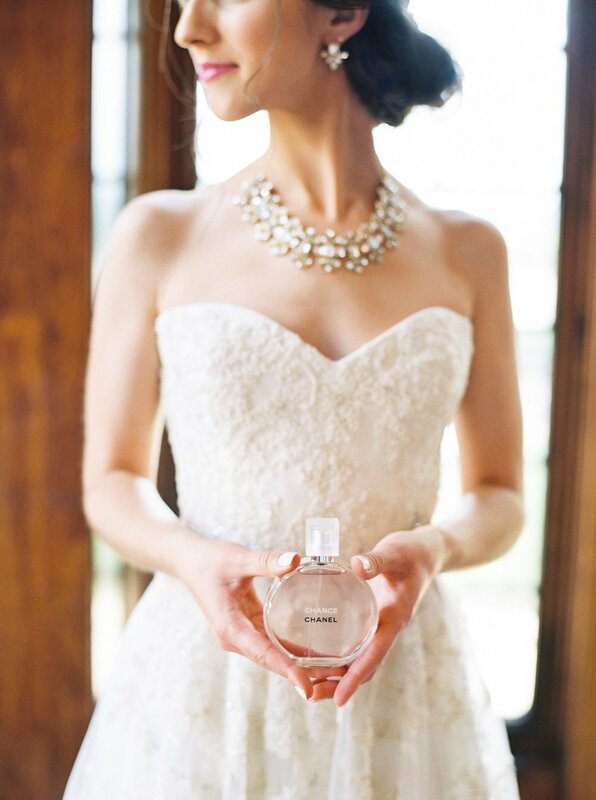 Perry made me feel like an absolute dream while capturing these romantic bridal portraits! I adore the ones she captured of me with my signature scent, Chanel Chance. Chanel, if you're looking for a hand model, I'm happy to be your girl! And of course, before I could even see Zack, I had to do a father first look with my dad!! It was a tradition I first read about on Southern Weddings back in 2012, and I absolutely fell in love with the idea of having such a sweet moment with the man who has been my favorite guy for the longest time. We both took a few moments to soak in how each other looked in our wedding attire (again, how dapper is he?! ), and shared some sweet sentiments with each other and my mom. I then gifted him with a little something special, a tie clip with "I loved you first" engraved on it, which was the title of our father daughter dance song! 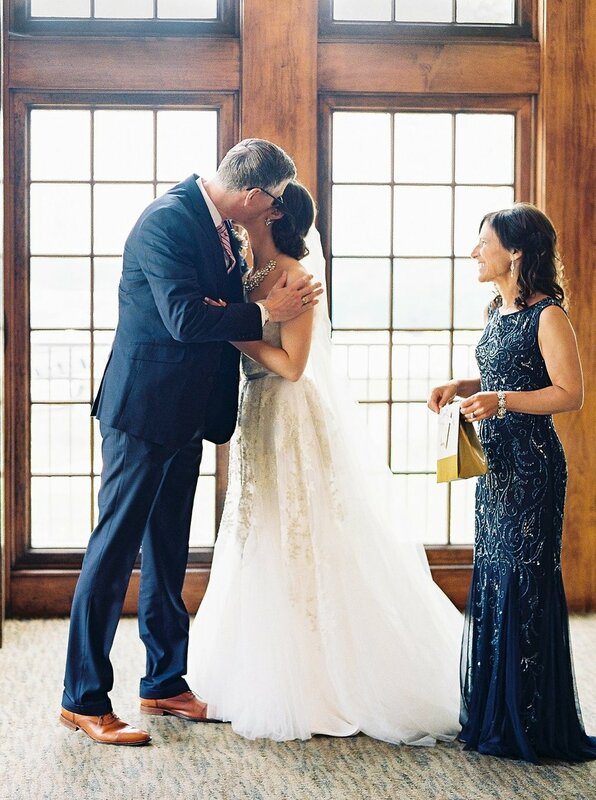 I am so grateful for all of these sweet getting ready photos Perry captured for us, and for our wedding film by Casey and Kristin that shows even more of our getting ready details!! Tomorrow I will be sharing a blog post about our first look!